I love watching the tennis. Love, love, LOVE it. Especially when it's at the top professional level. In my opinion, tennis beats the cricket any day of the week (apologies to all you cricketing tragics, but Ponting, Clarke et al just don't cut it in my book). The best part of summer television consists of watching the action on the court at the Australian Open and is worth all the nights of sleep depravation to catch every last backhand winner ripped down the line. It's just magic. But here's what I'm NOT enjoying so much: the incessant screeching (especially by the women) as a part of Every. Single. Shot. I mean, come on ladies. I know you're physically exerting everything you've got against your opponent and as a keen spectator I totally appreciate the efforts you're making but, FFS, I've gone through child-birth making less noise than that! And I'm not the only one. I read in the paper that the WTA are looking at ways to reduce the on-court shrieking, and warn they could penalise players under existing 'exessive noise' rules. Apparently the noise level from some of the worst offenders is almost 100 dB! How much of a big stick the WTA have remains to be seen but I hope there is something they can do. At best, it's annoying and irritating but at its worst, it can be off-putting and detrimental to the effectiveness of the opposing player's return. At any rate, we're now at the business end of the Open and we tennis fans are positively salivating over the prospect of semi-final matches to come: Clijsters vs Azarenka, Kvitova vs Sharapova, Nadal vs Federer and Murray vs Njokovic. This was my view of the world all of last week, dressed in my best bikini and sarong and modelling the latest in my long line of sun hat acquisitions. Kinda nice isn't it? Behold the pristine beauty and magnificent splendour that is Port Stephens, a short two and a half hour drive north of Sydney. Finally being in a place where summer was alive and well felt like paradise, especially after the dismal offerings of a unseasonally cold and wet December! We summer-starved Sydneysiders flocked to their beaches like moths to a flame. My boys have always been big fans of the surf and consequently they threw themselves into each oncoming wave with an exuberance borne of youth; their smiles blazing as wide as the expanse between the red and yellow flags on the beach. I greeted the water in the manner of seeing a long lost friend - arms open wide, a big grin plastered over my face and a little squeal escaping my Invisible Zinc-ed lips - and feeling all the accumulated stress and tensions of the just-finished year slip further and further away as each wave crashed over my body. We're now back home and I'm trying to get my head back into working mode but man, it's so hard. In a blink of an eye my mind is back in holiday mode, slapping on sunscreen and adjusting my hat before stepping out into the sunshine to do, well, anything I feel like. Isn't it gorgeous? 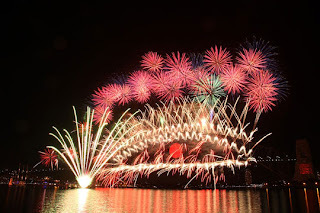 Sydney welcomed 2012 with an amazing show of fireworks - all choreographed to the theme 'Time to Dream'. We were happily ensconced at a nearby friend's house and watched it all unfold on the telly. I've always loved fireworks and last night's were awesome! The Provider tells me we'll be out on Sydney Harbour for the next New Year; apparently this was his plan for what we'd be doing THIS year but as they say, life is what happens when you're busy making plans. We had lots of fun regardless; seriously, is there anything better than being with a bunch of great friends on nights like these? The first day of January began with a rare sleep-in; I don't think anyone was up before 10am, not even the notoriously early rising Son #3. 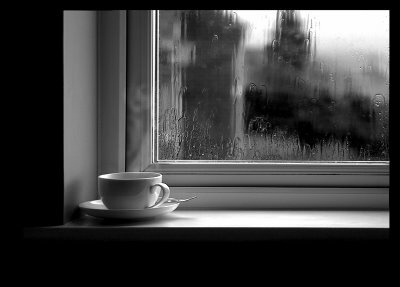 Walking outside with my coffee, I was pleasantly surprised by the warmth of the morning air. Even my mysterious guitar-playing neighbour was practising with added pizzazz. The reason? SUMMER HAD FINALLY ARRIVED! *throws arms in the air with glee* Mother Nature has finally decided to give this whole summer thing another chance. Let's hope she doesn't tire of the idea any time soon. I'm enjoying catching up on my Vitamin D stores. Tomorrow, we're packing up and heading north to Port Stephens for the annual family holiday. (Hence my pleas to Mother Nature). We have one whole week of rest and relaxation coming up - there'll be swimming, lazing about, poking through the local shops, reading, eating... and just being together as a family. I love this time of year for that very reason. Will make the effort of dragging my tired body around today cleaning, washing and packing gear totally worth it. I'm taking the laptop along for the ride so all things going well, I shall be blogging along the way.